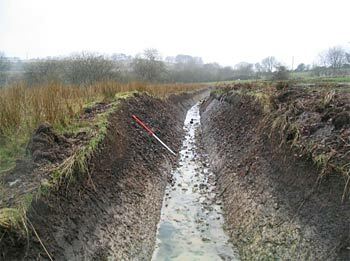 Archaeological recording of a burnt mound site was undertaken in February 2004 at Pwllauduon Farm in Ceredigion, (SN 65556295) with the support of the Cadw contingency fund. The burnt mound was revealed by agricultural ditch cleaning, and was identified during a Tir Gofal Farm Visit carried out by the Trust in October 2003. Archaeological recording of the site was subsequently proposed in order to ensure that an appropriate record was made of the exposed section. The north-facing section was cleaned and a section drawing produced at a scale of 1:20. Monolith samples were collected for environmental analysis (to be undertaken by Astrid Caseldine, University of Wales, Lampeter). Radiocarbon dates of Cal BC 1380-830 and Cal BC 1490-1310 were obtained for two charcoal samples from the exposed section. A rapid survey of the burnt mound and another probable burnt mound nearby was also carried out.